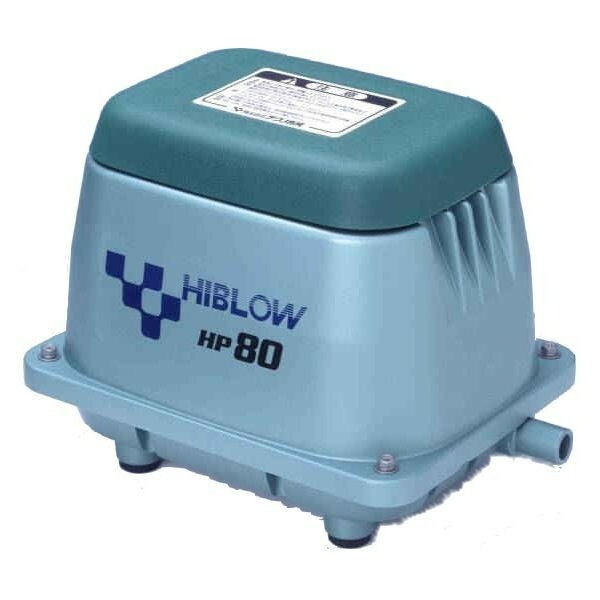 The ever popular Hiblow Air Pump Range are designed to drive multiple airstones at depth in your pond or filter chamber. Durability: The moving parts consist of an actuating rod supported by two special synthetic rubber diaphragms which vibrate laterally, permitting long-term continuous operation. No Lubrication Necessary: There is no friction between moving parts and therefore no need for lubrication, An added advantage being that the exhausted air is always clean. High Efficiency: Operation is based upon the principle of electromagnetic vibration which eliminates the need for sliding parts, thereby minimizing power consumption and offering high efficiency. Compact and Powerful: Hi-Blow air pumps incorporate two electromagnets, one to the front, the other to the rear, which act upon permanent magnets, providing perfectly-balanced vibration and allowing a compact but powerful device. Low Noise: Sound insulation was of prime importance when designing the pneumatic circuit and vibrating section and as a result it is exceptionally quiet. Smooth Air Flow : The exhaust rate is uniform and vibration minimal therefore it is ideally suited for applications which require consistent air preassure and supply.